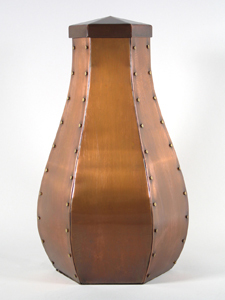 John Greco Urns offers custom handcrafted copper cremation urns using traditional metalsmithing techniques. All of these urns are designed and fabricated in my New Orleans based studio. I offer many different styles and sizes to suit a broad range of tastes and capacity needs. I take pride in the quality of my urns and great care is taken to ensure that each piece is designed with both aesthetics and functionality in mind. 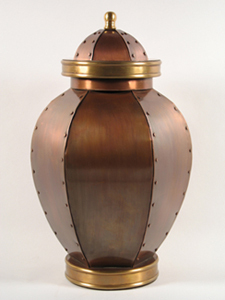 My urns are hand riveted and made from solid sheet copper with complimenting brass accents. Each urn is aged to give it a sense of antiquity and is stamped with my maker’s mark to ensure authenticity. 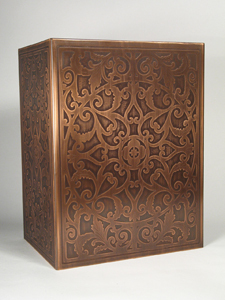 All urns can be customized with hand-etched names, dates and other personal information. I specialize in creating custom, one of a kind urns that are as unique and special as the loved one they are intended for. You’ll also find urns designed specifically for your family pet. I hope that I can provide you with a beautiful cremation urn that will not only stand out as a unique way of honoring your loved one, but as a unique work of commemorative art.